LG Innotek to Enter CMOS Sensor Design? The rumor is that up until recently LG Innotek used design services of Japan-based ENG to make its custom-tailored sensors. In the more distant past LG used to have a semiconductor group with its own CCD design. At the end of 90s LG Semiconductor was combined with Huyndai Semiconductor to form Hynix, later spun off as Magnachip. Now it looks like LG wants its image sensor capability back. 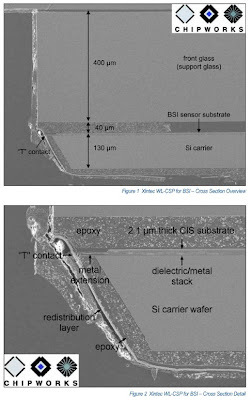 Future Sony BSI sensors are said to use more metal layers to achieve even higher speeds. A specially designed CXD4122GG companion ISP chip has support for high speed sensor features up to 50fps at 10MP resolution or up to 1000fps at 224hx72v resolution. To support high-speed signal-processing, the first-generation system required DDR2- SDRAM as dedicated image-processing memory and a separate SDRAM for program memory. In the second-generation system, however, Sony has succeeded in sharing external memory for both programs and image data by revising the image bus architecture and improving the image bus utilization efficiency. The new chip also makes use of LPDDR-SDRAM bus with no terminating resistors, reducing power by half comparing with the first generation ISP. The chip uses 90nm process. Another newly announced imagers are 1.4um FSI pixel-based ISX005 (3MP) and ISX006 (5MP) SoCs. The 1/5-inch ISX005 supports 1280 × 720p at 30fps, and the 1/4inch ISX006 supports 1920 × 1080p at 30fps and 1280 × 720p at 60fps HD video modes. Both SoCs are controlled by ARM7, equipped by 2-lane MIPI and support Scalado SpeedTags. Another newly announced 2nd generation 1.4-um pixel sensor family for mobile applications also emphasizes high speed: 5MP/22.5fps IMX072PQ, 8MP/15fps IMX073PQ and 13MP/15fps IMX074PQ are bare sensors supporting 1080p/30fps HD video. Yahoo: Omnivision reported results for Q3 of fiscal 2010 ended January 31, 2010. Revenues for the third quarter of fiscal 2010 were $156.9M, as compared to $183.3M in the second quarter of fiscal 2010, and $80.0M in the third quarter of fiscal 2009. GAAP net income in the third quarter of fiscal 2010 was $5.0M, as compared to $8.1M in the second quarter of fiscal 2010, and a net loss of $18.2M in the third quarter of fiscal 2009. Gross margin for the third quarter of fiscal 2010 was 24.6% as compared to 24.0% for the second quarter of fiscal 2010 and 22.4% for the third quarter of fiscal 2009. The sequential increase in gross margin reflected a slightly improved product mix and a reduced inventory valuation exposure due to the improving business outlook. Based on current trends, the company expects fiscal fourth quarter 2010 revenues will be in the range of $145M to $160M. IR: Can the back-illuminated technology be scaled up to larger chip sizes, like SLR size chips? Masashi "Tiger" Imamura, SVP and President of the Personal Imaging & Sound Business Unit: That's a pretty detailed technical question, but as you may know, back-illuminated technology was developed because of the very small pixel sizes. It's because on the surface of the sensor, a lot of the area is occupied by the interconnect, so the [light-sensitive] area gets very small. This made the engineers think: "How can we make it different, so we can get more area?" In the case of the APS-C or larger imaging sensor, the ratio between the area of the sensor and the peripheral circuits; the light-sensitive part already has a bigger area. So if we made it back-illuminated, there wouldn't be as much advantage as with a smaller sensor. Imamura: Other manufacturers have already announced back-illuminated technology, like Fuji, Casio. We can't describe the details of the competitors; even if we knew which camera was using which kind of sensor, but as far as a general comment about the sensor industry, Sony is not the only company to provide a back-illuminated sensor. Albert Theuwissen continues his excellent PTC tutorial - this new chapter is about readout stages thermal noise and its influence on PTC. 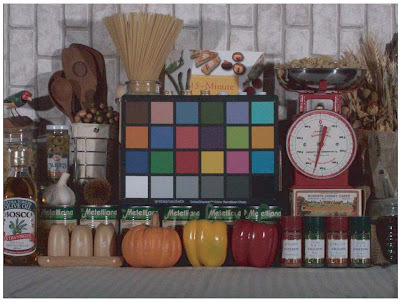 New Imaging Technologies logarithmic HDR sensor is described in January 2010 Vision Systems Design article. Thanks to A.T. for the link! iSuppli: The average resolution for handset cameras’ CMOS sensors in 2008 was 1.5MP. By 2009, that average increased to 2.1MP and iSuppli forecasts it will rise to 5.7MP by 2013. In comparison, DSCs averaged 7.6MP in 2008 and will rise to 13.9MP in 2013. "... a high-resolution camera phone may produce poorer image quality than a DSC because it has less sensitivity or poorer dynamic range, resulting in a relatively shallow contrast,” said Pam Tufegdzic, consumer electronics analyst at iSuppli. Still, "iSuppli believes that handsets may soon begin to cannibalize the low end of the DSC market as they incorporate higher megapixels and flash capabilities." 2010 Image Sensors Europe Conference published almost full agenda now. Just few topics and presenter names are missing, but there is still time left to fill them till March 23, 2010 when the conference starts in London, UK. Update: Chipworks already has 3 reports in its collection of 1.4um pixel reverse engineering. Other than Omnivision BSI, it has Samsung 8MP S5K3H1G and Aptina MT9P111 5MP SOC reports. "Similar cameras manufactured on similar product lines may operate non-uniformly. For example manufacturing variations may result in variations in response to external stimuli, such as ambient light. Such variations in camera responses may produce a non-uniformity in images rendered by digital cameras of the same type, consequently, leading to an inconsistent product performance and to variations in product lines(s)." So the company tries to patent calibration of the camera modules. Thanks to S.S. for the link! There is only one image sensor among EDN's 2009 Innovation Award Finalists: Aptina's MT9M033. The 1.2MP WDR sensor delivers 720p/60fps video and has 120db pixel DR. Its pixel size is 3.75um. More information is at Aptina site. The Innovation Award winners will be announced on April 26. Market Wire: DALSA CCDs power 196MP resolution (17,310 pixels x 11,310 pixels) UltraCamXp and UltraCamXp Wide Angle cameras produced by Microsoft's photogrammetry business, Vexcel Imaging, GmbH. The cameras use multiple DALSA CCDs to provide detailed aerial imagery for applications such as Microsoft Bing Maps. Albert Theuwissen published the concluding part of his ISSCC 2010 High Speed Forum papers review. 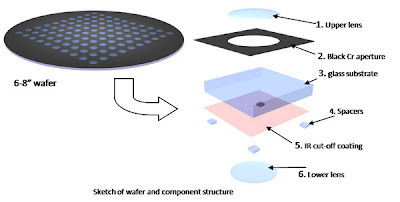 This part overviews 3D ranging technologies and vision chips by Tokyo University, high-speed image processing by Zoran, sensor interfaces by Analog Devices and testing issues by Agilent. Highly recommended read! Wired: Softkinetic-Optrima’s gesture-recognition technology will be bundled in a set-top box (STB) running on top of Intel’s powerful Atom Processor CE4100. That chip will appear in Orange’s cable services in Africa, Europe and the Middle East by the end of this year or early next year, and likely in the United States as cable and satellite providers incorporate Intel’s chip. “We provide basically the exact same technology [as project Natal], except not being Microsoft, we can adapt it to many other environments, like television and set-top boxes,” said Softkinetic-Optrima managing director Michel Tombroff. Update: VerticalWire: Softkinetic-Optrima officially announced it has adapted its gesture recognition platform to Intel Atom Media Processor CE 3100. “The 3D imaging market is entering into a phase of rapid growth, and 3D imaging solutions will soon be integrated into television sets and set-top boxes, offering consumers an unprecedented level of interactivity with their TV,” said Michel Tombroff, Softkinetic-Optrima managing director and Softkinetic CEO. The solution will be available to consumer electronics developers in Q2 2010. XTR claims its technology uses "a single standard webcam". However, the XTR device in the demo does not look like the standard webcam. My sources told that the trick is in so called "split lens" - I would love to learn more about this approach. Business Wire: Nemotek, a Morocco-based Tessera's licensee, launches its first two-element VGA wafer-level lens. The two-element lens utilizes glass wafers instead of traditional plastic. An infrared filter and apertures are also incorporated into the lens structure. "We expect that overall imaging revenues (CMOS + CCD array sensors) are set to moderately grow at a CAGR of 5% within the next 5 coming years. However, if CCD image sensor sales are set to decrease with time, this is not the case of CMOS image sensors as we forecast CIS sales to grow at a CAGR of 11% from 2010 to 2015. 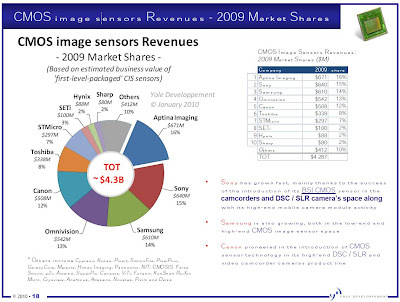 Actually, CMOS image sensors already surpassed CCD sensor revenues in 2007 and this trend will be even accelerated with the emergence of a wider 300mm CIS infrastructure in Asia and the introduction of future CMOS BSI(Backside illumination) technology." Summit Microelectronics announced it provides a autofocus driver for Lensvector liquid crystal lens. The SMB274 driver is powered by an on-chip charge pump. 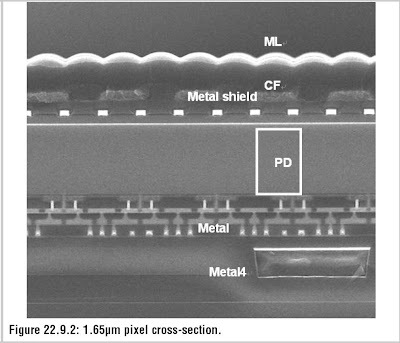 The chip is offered in a 1.34mm x 2.34mm, 15-ball WLCSP package. Samples and Evaluation Kits will be available later this quarter from Summit and LensVector. Business Wire #1, #2: Aptina emphasizes HD video performance in its new 1.4um pixel 14MP sensor. The 1/2.3-inch MT9F011 mobile camera image sensor leverages A-Pix Technology and delivers 1080p/60fps HD video. The HD video optimized features include low power consumption, a four-lane MIPI data interface, Bayer resample for improved video, and 25 degree chief ray angle to minimize module height. 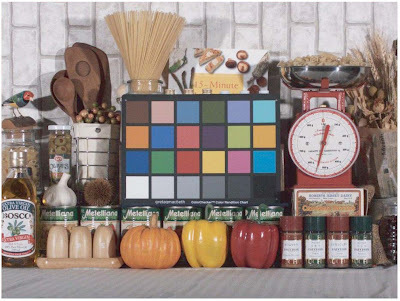 Aptina A-Pix technology is said to provide sensitivity that is BSI-equivalent, yet with less crosstalk, lower noise and more accurate color reproduction. Samples of the MT9F011 are currently available with mass production expected in Q2 2010. High Resolution Stills from High Speed Video - Enough to Create a Company? Physorg.com quotes University of Oxford's Dr. Peter Kohl saying "Dr Gil Bub from my team then came up with a really great idea to bring together high-resolution still images and high-speed video footage, at the same time and on the same camera chip". As Nature Journal reports, "by offsetting pixel-exposure times during capture of a single image frame, embeds temporal information in each frame. This allows simultaneous acquisition of full-resolution images at native detector frame rates and high-speed image sequences at reduced resolution, without increasing bandwidth requirements. We demonstrate this method using macroscopic and microscopic examples, including imaging calcium transients in heart cells at 250 Hz using a 10-Hz megapixel camera." This concept has attracted the attention of Cairn Research, a UK based scientific instrument manufacturer. The technology has been patented by Isis Innovation, the University of Oxford's technology transfer office, which provided seed funding for this development. Dr. Mark Pitter from the University of Nottingham is planning to compress the technology into an all-in-one sensor that could be put inside normal cameras. Update: UK Telegraph published quite a long article on the camera idea. Trading Markets: Omnivision announced OV5647, a 1/4-inch, 5MP RAW image sensor based on its 1.4um BSI technology. OmniVision’s 1.4um OmniBSI pixel delivers 680-mV/lux-sec sensitivity. OV5647 has 720p/60fps and 1080p/30fps HD video modes. The 720p/60 HD video is captured in full field of view with 2 x 2 binning. Additionally, a post-binning re-sampling filter function unique to the OV5647 removes image artifacts around edges and minimizes spatial artifacts. 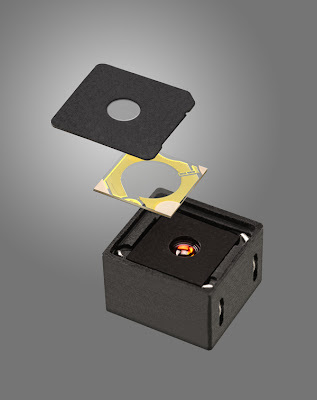 The sensor fits into 8.5 x 8.5-mm module size with a z-height of less than 5-mm. It supports parallel port or two-lane MIPI and provides 10-bit images in RAW RGB format. The OV5647 is sampling now and will enter mass production in July 2010. According to iSuppli, 5MP cameras will account for over one-third of all camera phones by 2012. PR NewsWire: Mixel announced it has licensed its M-PHY MIPI IP to Graphin. The companiew will collaborate to produce 'Golden M-PHY' IC to be used in Graphin's Image Sensor Evaluation Systems. Silicon Image announced that it uses Tessera’s FotoNation FaceTracker solution in its camerIC-18MP ISP. The camerIC-18 ISP IP core integrates the Lightweight Hardware Face Detector (LHFD) version of the FotoNation FaceTracker version. The LHFD version is a mixed hardware / software implementation that is said to detect up to 10 faces in the camera viewfinder in 0.1 seconds. Tessera also reported it has licensed FaceTracker solution to SK Telesys. SK Telesys, based in Seoul, Korea, will integrate the Tessera(R) technology into its 3G-enabled handset, the W-Phone (SK-700). NEC introduced its new Camera Engine 151 (CE151) SoC , an image-processing device for camera phones. The new SoC also enables full-HD (1080p) video stream and still-image data up to 13 MP. The new SoC has an improved noise-reduction function that "offers the latest generation 1.1-micron sensors to record still images and video frames". In 2007, NEC launched the CE131 SoC, which provided the 8MP mobile-phone market segment with accumulated shipments exceeding 30 million units. NEC also introduced the CE143 SoC in 2009, which enabled processing of 12MP images and full HD video. PR NewsWire: Toshiba announced availability of new bridge chip for use in mobile phones, s MIPI camera serial interface (CSI) to a Mobile Display Digital Interface (MDDI) chip. The TC358740XBG camera bridge chip provides connectivity for MIPI cameras to baseband or application processors using an MDDI interface and supports up to two cameras, with the primary camera (up to 12MP) using a MIPI link and the secondary camera (up to 2MP) using a MIPI link or parallel port. Engineering samples are available now with mass production scheduled for Q4, 2010. Albert Theuwissen posts the first part of his review of the one-day forum “High-Speed Imaging Technologies”, organized and chaired by Johannes Solhusvik (Aptina). The first part covers Boyd Fowler (Fairchild), Jan Bosiers (DALSA), Guy Meynants (CMOSIS) and Shoji Kawahito (Shizuoka University and Brookman Technology) presentations. The thickness of silicon layer appears to be about 3um, which should give Sony excellent QE. Indeed, red QE approaches the green one, according to the relative graphs in the presentation. No absolute QE numbers are given. Metal aperture does not seem to have an electrical contact to the backside. The backside planarization looks is next to perfect. It seems that Sony has created the ultimate Bayer pixel - at least I do not see what else can be improved here. The low-light luma-SNR after AWB and CCM is 14.5dB is 10 Lux, as measured at 18% gray patch from a 5500K light source through F2.8 lens. Business Wire: Lensvector announced that Foxconn and UMC have joined Samsung as investors in the company’s $30 million Series C financing round. Other investors joining the Series C round include TransLink Capital and Harbor Pacific. The proceeds will be used to expand LensVector operations and bring the total financial backing of the company to more than $50 million. Red Orbit: Galaxycore announced that it has reached a milestone with its key foundry partner SMIC and shipped 100,000 8" wafers. The 0.13um and 0.153um CIS process its foundry partner SMIC uses to manufacture GalaxyCore's products is claimed to have the least photo layers in the industry and is thus the most cost-effective. Chris Chi, Senior Vice President and Chief Business Officer of SMIC said, "GalaxyCore has more than 40% of the CIS VGA market share and is currently the largest in China. Together with SMIC, the largest foundry in China, we have confidence to better serve China's rapid growing consumer electronics market and enhance the VGA market penetration." Business Wire: Samsung announced 5MP S5K4E2 and 3MP S5K5CA imagers, both based on 1.4um pixel, apparently FSI. S5K4E2 pixel is said to use SEES (Samsung Enhanced Energy Steering) technology. "The SEES pixel, integrates more light into an optimized pixel structure to present clear, high resolution images." No such claim presented for S5K5CA pixel. The 1/4-inch 5MP S5K4E2 imager integrated EDoF IP with in-focus range from 15cm to infinity and delivers full resolution video at 15fps speed. It's designed to fit into a 6.5mm x 6.5mm module with a height of 4.5mm. The sensor has "advanced noise removal logic" integrated. S5K5CA is a 1/5-inch, 3MP imager SoC that with integrated ISP, fitting into 6.5mm x 6.5mm fixed focus camera module. The S5K5CA is said to offers 10 percent improvement in SNR against the previous 3MP imaging solution, apparently based on 1.75um pixel. Samsung’s new S5K4E2 is currently sampling and will be in mass production by the end of Q1 2010. Samsung’s S5K5CA is in volume production for many of the world’s top handset manufacturers today with products on the market expected later in 2010. Albert Theuwissen published the concluding part of his review of Image Sensor session at ISSCC. 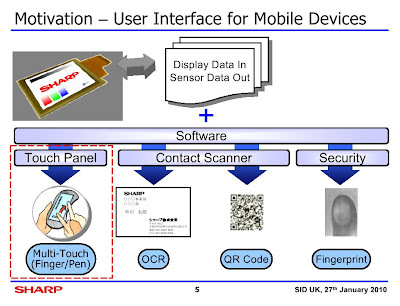 Few papers on sensors for emerging applications are complemented by Sony 10.3MP BSI sensor paper with many more performance details. As Eric Fossum mentioned in comments, IISW 2009 papers are in open access now. EON: Automation Engineering Incorporated (AEi) demonstrates its CMAT (Camera Module Align, Assembly, and Test) flexible automation platform at Mobile World Congress 2010. Leading manufacturers are said to use CMAT for both new product development and full-scale production deployment. CMAT has five degree of freedom active alignment capability and works with resolutions up to 16MP. Albert Theuwissen published first part of the overview of Image Sensor four session presentations. Four papers reviewed have quite interesting interesting content. Business Wire: Heptagon announced that it will ship its 100 millionth wafer-scale, reflowable lens for CMOS Imaging applications within the current month. Almost all of these lenses have been shipped for use in mobile handset cameras. Chuck Milligan, Heptagon’s CEO says: “The lens solutions we are shipping have progressed from simple, but extremely tiny, singlet lenses to stacks of lenses enabling high-quality VGA and Megapixel resolutions. Shipping 100 million lenses is a significant milestone for Heptagon, and we believe it places us well ahead of any of our followers in wafer-scale lens technology. With strong continuing demand for current products, and a number of new products ranging from VGA to 8+ megapixel in the pipeline, we expect to be announcing over two hundred million of lenses shipped within the next few quarters and to continue growing from there." VentureBeat, TechOat published a very nice overview of gesture control activity. Canesta-GestureTek, Softkinetic-Optrima, Hillcrest Labs, Kakai, Mgestyk, PrimeSense, Sixense-Razer, Omek InterActive and Ball-it. The review mostly covers end-user system designers, so camera companies like PMD, MESA Imaging, TYZX are not mentioned. Even among end-user vendors there are some omissions, like XTR 3D. Still, the review is full of interesting information, links to articles, demos, videos - highly recommended read for everybody to get a feeling of the competing approaches on this promising market. Thanks to A.J. for sending me the link. Digitimes: Pixart expects revenues share of its optical touchscreen products to reach 10% in the second half of the year, according to company chairman Huang Sen-huang. 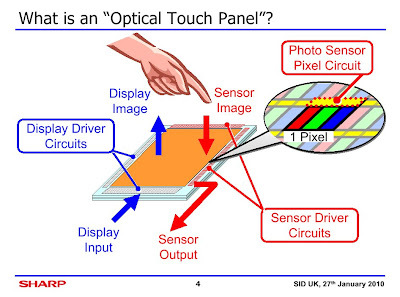 The company has introduced two optical touchscreen solutions – one has two CMOS sensors plus DSP, the other one has three CMOS sensors plus DSP. Pixart partnered with Quanta Computer to develop optical touch products and has also begun cooperation with another optical company. Pixart announced revenues of NT$1.03 billion (US$32.27 million) for fourth-quarter 2009, a sequential decrease of 10.4%. Gross margin dropped to 43.4% for the quarter from 47.7% in the third quarter mainly due to a change in product mix. Fourth-quarter net profits decreased 21.3% to NT$225.4 million. For 2009, total revenues decreased 21.9% to NT$3.75 billion from NT$4.80 billion in 2008, generating net profits of NT$848.2 million. Pixart expects to see revenues stay flat in the first quarter of 2010. It has estimated a 5% revenue growth for mouse related products but a 30-40% decline in the PC webcam segment for the quarter. Digitimes quotes Pixart chairman Huang Sen-Huang saying that Pixart will spin off its CMOS image sensor design subsidiary - PrimeSensor Technology - at the end of the first quarter 2010. PrimeSensor will focus on standard CIS targeting China's white-box handset market independently, while Pixart will maintain its stake in the subsidiary at about 30%, with the remaining 70% shared by MediaTek and UMC, Huang said. MediaTek ships to China's white-box handset market about 400,000-500,000 units per month. Huang said if one CIS chip is included in each handset solution, this will benefit PrimeSensor. The spin-off PrimeSensor was founded in May 2008, the chairman said. So, now we have two more similar names in the industry: Primesense dealing with 3D imaging and the newly announced Primesensor. Albert Theuwissen published the live impression from Sony SVP Tomoyuki Suzuki plenary talk yesterday - a lot interesting information there! OptoIQ reports that camera vendor Imaging Development Systems (IDS; Obersulm, Germany) announced it uses the MD1-10-B Logarithmic sensor from New Imaging Technologies (NIT; Evry, France) in the design of its latest high-dynamic-range (HDR) uEye camera. With a dynamic range of 120 dB, the camera features a 768 × 576-pixel imager in a 1/1.8-inch format, operating at 50fps. Matrice Active à Génération d’Image indexée sur Contraste (MAGIC) sensor developed at NIT uses a pixel design based on a photodiode operated in photovoltaic mode so that the open-circuit voltage across the pn junction is proportional to a logarithmic value of the incident light intensity. To remove FPN there is a MOS transistor connected across the photovoltaic photodiode. When activated, this MOS transistor zeros the voltage of the photodiode under illumination and gives an exact dark reference voltage, used to remove FPN later on. The same article tells that another camera vendor Point Grey Research (Richmond, BC, Canada) teamed up with CMOSIS (Antwerp, Belgium), embedding the company’s 1-in., 5.5 × 5.5um, 2048 × 2048-pixel, 170-frames/s CMV4000 and 2/3-in., 5.5 × 5.5um, 2048 × 1088-pixel, 340-frames/s CMV2000 into its line of Gazelle Camera Link cameras. For the first time since March 2009 I found Himax tells something about its image sensor business progress. The company mentions in its Q4 2009 and Full Year results: "we commenced shipments of our ... CMOS image sensor product lines ... in small quantities initially, we believe the commercial shipment is paving the way for us to tap the great market potential in ... emerging segments. 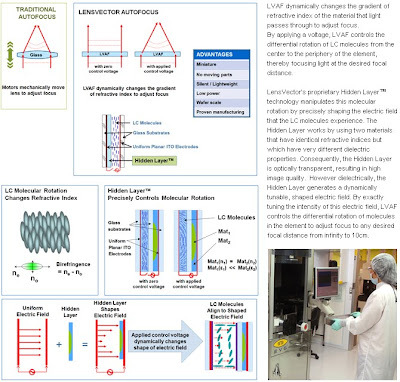 In addition, we made inroads into the leading-edge wafer level optics, which are expected to replace the conventional lens, starting with lower resolution camera modules. Currently, we offer products with VGA and 2 mega pixel resolutions, mainly focusing on cell phones and Notebook PCs. Our wafer level optics have been well-received by a number of the world's first-tier CMOS image sensor and camera module makers." EETimes reports from Tomoyuki Suzuki, Sony VP pleanary talk at ISSCC 2010 that future sensors are proposed to be bent into a spherical shape, enabling it to capture wide-angle images like an eyeball. The performance targets of such future device include 4K x 2K video capture, less than 0.1 Lux video capture and 1,000 frames per second. Albert Theuwissen published his first report from ISSCC 2010. The report mainly talks about Jean-Luc Jaffard of ST Micro presentation on TSV and WLC progress, predicting that in few years we'll see wafer-level auto-focus implemented. OmniVision announced the introduction of the world's first 1.1-um BSI pixel, OmniBSI-2. 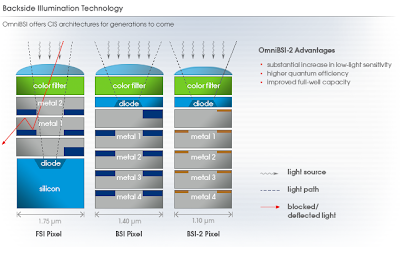 Proclaimed OmniVision's second-generation BSI technology, the is pixel is built on a 300-mm copper process at 65 nm design rules developed in cooperation with TSMC. An exact quote from the PR: "By combining custom 65 nm design rules and new manufacturing process modules, the 1.1-micron OmniBSI-2 pixel achieves industry-leading low-light sensitivity as well as significantly reduced dark current and full-well capacity." OmniBSI-2 pixel design features layout, better isolation, and significantly reduced crosstalk over the first generation OmniBSI technology. OmniBSI-2 technology can also be applied to larger pixel designs to achieve performance advantages over current BSI and FSI image sensors. "By comparison, the new 1.1-micron OmniBSI-2 pixel not only outperforms our current 1.75-micron FSI architecture, but it also equals the performance of our industry-leading 1.4-micron BSI pixel that is currently in mass production," commented Dr. Howard Rhodes, vice president of process engineering at OmniVision. "Migrating to 1.1-micron BSI pixel architecture required moving production to TSMC's state-of-the-art 300-mm copper process, which enabled substantially improved design rules and more advanced process tools, resulting in tighter process control and improved defect density. Key to our success was the joint development by the OmniVision and TSMC R&D teams of multiple new process modules that substantially improved opto-electronic performance. We also leveraged our close partnership with joint venture partner VisEra Technologies to establish a 300-mm color filter fabrication capability." OmniVision's OmniBSI-2 technology will be demonstrated to customers by appointment at the Mobile World Congress, February 15 through 18, 2010 in Barcelona, Spain. No word is said about products to be demonstrated or their status (prototype, CS, ES, production, etc). Business Wire: Tessera announced that Samsung has integrated Tessera’s EDOF capabilities and UFL solution into its new 2.0MP HD (1080p) image sensor for notebook computer cameras and other applications. 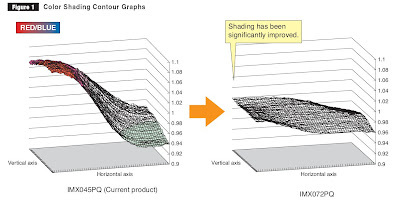 The UFL solution is said to improve low-light performance by increasing the amount of available light as much as 250 percent, without degrading the field depth or other performance factors. With ISSCC 2010 starting off today, Albert Theuwissen plans to publish his instant impressions in the Harvest Imaging blog. I'm sure it's going to be very interesting series, stay tuned! Digitimes' sources report that Samsung plans to add one more 8-inch fab for image sensor production in 2010 to satisfy increasing market demand. So far the company has two 8-inch and one 12-inch fabs manufacturing CIS products in South Korea. Samsung already increased monthly capacity by 12,000-20,000 wafers to its two existing 8-inch fabs, which produced 40,000-45,000 wafers per month originally, in the second half of 2009. The new 8-inch fab will have about 20,000 wafers monthly capacity and can go up to 90nm processes, compared to 0.11-micron processes at the older two 8-inch fabs. The 12-inch fab's monthly capacity is 20,000-25,000 wafers. Digitimes' sources think Samsung's recent capacity expansions are related to increased orders from HTC and strong netbook sales in China. OmniVision too has increased its wafer starts at TSMC. Aptina has also expanded capacity at its 8-inch fab in Italy and will speed up CIS production at another 8-inch fab in Japan in 2010, according to Digitimes's sources. Wall Street Journal published an article about LensVector technology and history. The company, founded in 2006, has raised $53 million from venture capitalists and the investment arms of Samsung Electronics Co. and Eastman Kodak Co. It is expected to announce a $30 million funding round Thursday, and discuss its plans publicly for the first time. Only 16% of camera-phones sold in 2009 have AF, according to iSuppli. TSR estimates the current cost of components and labor to add autofocus at around $3.50 to $4 per phone. LensVector CEO Derek Proudian plans his products to start at about the same price and get more cost-competitive as the company boosts production. LensVector expects to eventually be able to churn out 60 million lenses a year from production lines in Silicon Valley, turning to external manufacturing partners later if needed. "It's not official yet, but I think there's a good chance we will see it this year" in Samsung cellphones, said Brian Kang, managing director of Samsung's venture-capital arm. LensVector's technology is silent and works well with videocameras and could be used in computers and other devices beyond phones. The article also quotes Aptina as "familiar with LensVector's technology". Update: Business Wire published LensVector's official PR. The company announced it has closed $30 million in a Series C financing round, bringing the total financial backing of the company to more than $50 million. Institutional Venture Partners (IVP) led the new funding and joins existing investors Menlo Ventures, Samsung, Silicon Valley Bank, Mitsui and Kodak. LensVector plans to use the financing to expand manufacturing capacity. Imaging Resource: Nikon announced P100 camera equipped with 10.3MP (eff.) 1/2.3-inch BSI sensor with a plenty of high-speed based features, including 1080p movie mode. This is the first time when Nikon uses CMOS sensor in a compact camera - all its previous models relied on CCDs. Hexus: Ricoh released CX3 camera with BSI sensor, incidentally also with 10.3MP in 1/2.3-inch format. The CX3 camera too has many high-speed features. EETimes, Business Wire: TowerJazz and Soitec announced they will jointly develop a solution for SOI-based high-end BSI CMOS image sensors aimed at industrial, medical and automotive applications. Yole Developpement principal analyst Jerome Baron expects the high-end BSI image sensor market to reach $120M by 2013, while the total BSI sensor market is to reach $800M at the same time frame. The BSI foundry solution is said to enable a rapid ramp by TowerJazz customers. TowerJazz said it will integrate SOI substrates and Soitec's Smart Stacking circuit layer transfer technology, customized for the TowerJazz fabrication process. Soitec claimed that its Smart Stacking technology aims chip manufacturers to leverage wafer-to-wafer level stacking through low-stress bonding and high-precision thinning of partially or fully processed circuits. Smart Stacking was developed originally at Tracit Technologies SA, which Soitec acquired in July 2006. Tracit (Grenoble, France) was itself a spin-off from CEA-Leti. Aegis: Toshiba-Teli launched CSDS60CM3 and CSDW60CM28, the BSI sensor-equipped HD color cameras targeted to factory automation, quality control, robotics and the life sciences. 1/3-inch format CSDS60CM3 provides 1280 x 1024 resolution, while 1/2.8-inch CSDW60CM28 resolution is 1920 x 1080, both at 60fps progressive speed. The BSI sensor pixel size is 2.5um for CSDW60CM28 and 3.63um for CSDS60CM3 cameras. It would be interesting to learn who makes these relatively large pixel BSI sensors. Meanwhile Fujifilm announced its first BSI sensor-based camera. The new HS10 camera uses 1/2.3-inch 10.3MP (eff.) sensor (Imaging Resource). It appears to be similar to the sensors used in recent Sony, Casio, Samsung and JVC BSI cameras. Remove moving subjects from your shots. This mode captures 5 images of a scene in quick succession; the five images are then analyzed and combined in-camera to produce a single image where anything moving in the scene is removed. This mode captures 5 images of a moving subject in rapid succession and combines them into a single composite image containing multiple sharply-captured views of the subject motion. Combines high and low ISO exposures of the scene being photographed to reduce blur caused by camera shake without significantly increasing image noise (first appeared in Samsung cameras 4 or 5 years ago). The FinePix HS10 also has the ‘Pro Low Light’ mode, which combines several exposures into a single image for low noise output in low light (first appeared in Casio and Sony cameras and, possibly, Sony-Ericsson phones few years ago).